I have two things here to inform, entertain and instruct. Many Americans think it is unsafe and dangerous to come to the Holy Land. However, 3.5 million people are walking the streets, praying at holy sites and following the footprints of Jesus and his Mother. In the first you will hear the testimony of pilgrims with me who have been from one end of Israel to the other and found it completely safe, beautiful, spiritual and friendly. 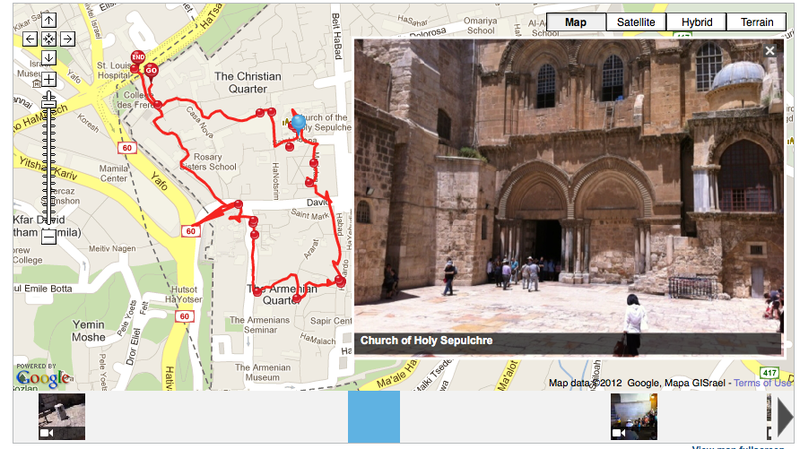 The second item below is my run/walk today through Jerusalem to show you have safe and wonderful it is over here. Families, pilgrims, locals, tourists with children walking joyously through the streets. Enjoy – and come! Part One: We visited the site of Mary’s birth, where the Immaculate Conception took place. It was also here that Jesus cured the cripple at the Pools of Bethesda in John 5. We listened to some Protestants belittling Mary and the Catholic Church there. Another guide was mocking the Via Dolorosa. We then went to the Western Wall and I told the pilgrims the story of the Wall and we all prayed there — for the conversion of the Jewish people. It was pretty exciting since it was Bar Mitzvah Thursday. Then to lunch at Ramat Rachel overlooking Bethlehem before a free afternoon. Then the happy-sad part. We all had dinner together and hugged, cried, said our good-byes and got a lot of comments on video for all of you to see.